"The addition of pumpkin puree made these the best cinnamon rolls I've ever tasted." Mix brown sugar, 1/4 cup white sugar, and cinnamon together in a small bowl; set aside. Combine yeast, 1/2 teaspoon white sugar, and warm water in the bowl of a stand mixer. Whisk together and set aside until foamy, about 10 minutes. Pour pumpkin puree, cream, 1/4 cup white sugar, 1/4 cup melted butter, salt, 1/2 teaspoon vanilla, ginger, allspice, 2 cups flour, and the egg into stand mixer bowl with the yeast mixture. Mix with dough hook attachment until combined, about 2 minutes. Stir in 2 1/4 cups flour and mix on low with the dough hook, adding more flour if the mixture is too sticky, until dough is slightly sticky, smooth, and elastic, 6 to 7 minutes. Remove dough and shape into a ball. Coat the bowl of the stand mixer lightly with vegetable oil, return dough to the bowl, turning to coat with oil. Cover with aluminum foil and set aside in a warm place to rise until doubled in size, about 1 1/2 hours. Generously butter a 13x9-inch baking dish. Transfer dough to a well-floured work surface. Use your hands to flatten into a rectangular shape about 1-inch thick. Generously sprinkle flour over both sides of the dough; roll out to about a 20x12-inch rectangle. Pour melted butter over the top and brush evenly over the surface, leaving 2-inches along one wide edge unbuttered. Sprinkle the brown sugar mixture over the dough and moisten the unbuttered edge with water. Starting at the wide edge with butter, roll dough tightly into a log; press firmly along moistened edge to seal. Trim uneven ends from the roll and discard. Cut rolled dough into 16 equally-sized pinwheels. Place the pinwheels, cut side up, in the prepared baking dish. Cover with plastic wrap and set aside in a warm place to rise until doubled in size, 45 to 60 minutes. Bake in the preheated oven until golden brown, about 30 minutes; set aside to cool slightly while mixing glaze. Whisk cream cheese, confectioners' sugar, milk, and vanilla extract together in a large bowl until smooth; drizzle over the warm cinnamon rolls. 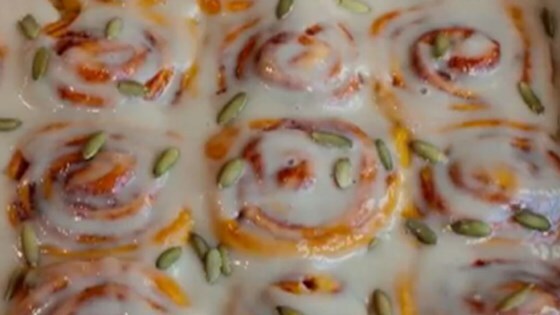 Sprinkle pumpkin seeds over the rolls to serve. A shockingly easy country bread with a subtle, earthy flavor. Made this recipe for a fundraiser. They look and smell great! Topped with Halloween decorations!